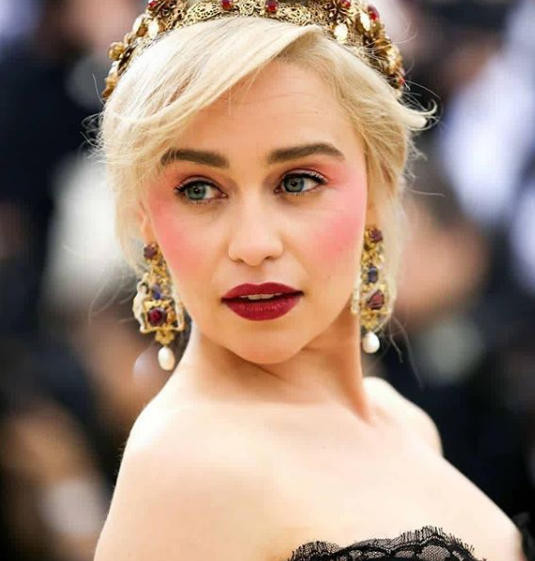 Popular for portraying Daenerys Targaryen or, Khaleesi from the hit HBO's TV series, Game of Thrones, Emilia Clarke, is one of the most desirable women in the world. She earned a huge fan following after she appeared on the highly rated TV series. Moreover, she also received several awards and nominations for her breakout role in the series. Her role as Daenerys Targaryen on HBO’s television series Game of Thrones. Emilia Clarke said she suffered two "life-threatening" aneurysms. The actor, who plays Daenerys Targaryen, underwent surgery twice, leading to "terrible anxiety" and panic attacks. Despite thinking she would die, Clarke has now recovered beyond her "most unreasonable hopes". The actress, who is from Oxford, plays a young princess sold into marriage who she describes as "a figure of power and self-possession". Clarke's character, Daenerys, is described as "a blend of Napoleon, Joan of Arc and Lawrence of Arabia". Doctors diagnosed her with having a subarachnoid hemorrhage (SAH), from which a third of sufferers die immediately or soon after. After the surgery, a condition called aphasia set in, meaning she could not communicate and feared her acting career was over. "In my worst moments, I wanted to pull the plug," she said. "I asked the medical staff to let me die." She recovered enough to return to filming Season 2 of Game of Thrones but said: "I was often so woozy, so weak, that I thought I was going to die." She says she is now "at a hundred percent" and has helped develop a charity that supports people recovering from brain injuries and strokes. Who is Emilia Clarke's father? English actress Emilia Clarke was born in London, England. She is of English ethnicity and has British nationality. Her birth name is Emilia Isabelle Euphemia Rose Clarke. She was born to a sound engineer father and a businesswoman mother. Clarke grew up together with her brother. Since childhood, she has built up a strong interest towards entertainment field. Clarke studied at Rye St Antony School and at St Edward’s School, Oxford. She also joined Drama Centre London and graduated in 2009. In November 2016, Clarke was cast as the female lead in Solo: A Star Wars Story, released worldwide on 25 May 2018. Some of her nominated awards include Primetime Emmy Awards, Screen Actors Guild Awards, Screen Actors Guild Awards, Critics' Choice Awards, and Satellite Awards among others. Who is Emilia Clarke husband? Reflecting on the personal life of Emilia Clarke, she is single. Although her career took on a successful path her love life couldn’t do so. Previously, she was in a relationship with Seth MacFarlane in 2012 which soon end in 2013. She was rumored to have hooked up with James Franco in 2013 and Jared Leto in 2014. She was in a relationship with Cory Michael Smith in 2014 and Jai Courtney in 2015. There isn’t any information about her being in other relationships that we know of. There isn’t any solid proof which leads towards her married life and children. How much does Emilia Clarke make per episode? Emilia Clarke has an estimated net worth of $13 million as per Celebrity Net Worth. She earns a salary of $1.1 million to $2 million per episode of Game of Thrones. In October 2016, The actress bought a mansion for $4.6 million, in Venice, California. The 2,800-square-foot home has two bedrooms and three baths inside. In 2018, Clarke put her $5 million home for rent for $25k per month in Venice Beach. The house boasts two-bedroom, 2.5-bathroom. Clarke not just earns huge money but also is involved in several charitable organization. She became an ambassador of SMA TRsut Team in 2011 and six years later, she became a patron of a non-profit organization, Open Door which helped the young people gain access to the acting school audition. Clarke raised $120k for the J/P HRP & Disaster Relief Organizations after she auctioned a chance to watch an episode of Game of Thrones with her. As of 2018, she became an ambassador to the Royal College of Nursing in the UK. Observing her body statistics, Emilia Clarke has a height of 5 feet 2 inches. Her body weighs 58kg. She has dark brown hair and green eyes. Her body figure measures the size of 35-26-37 inches. Her bra size is 32C, dress size is 6 (US) and shoe size is 8 (US). She can sing and play some piano, flute, and guitar. She is highly skilled at alto, ballads, blues, cabaret singing, and jazz singing. In late April 2013, she suffered a brain aneurysm. She was treated at the New York Presbyterian/Weill Cornell Medical Center in Manhattan and she recovered.